It's time to come clean. I game All Things Zombie and love it. I painted up my gang. I made the base boards. I made the buildings. I made the traffic lights and street lamps. I purchased some vehicles. Heck, I even made a Bus Stop. You can read all about it here if you don't believe me: Bus Shelter! But I didn't bring any Zeds to the table. "Well, what 's the fuss about?" you might ask. After all, you made all that scenery stuff. Seems right other players would bring their own survivors and some Zeds to the table. Well, I agree with you wholeheartedly. But I went out and bought me a pack of Zeds anyway. Why? Well, because I wanted to. More Zeds mean even more epic games. 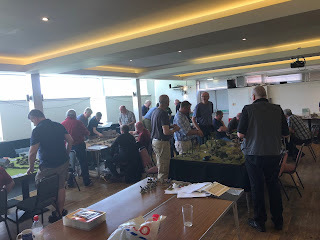 And, truth be told, it also lets me run demo games with newbies to the World Beyond GW (It's a big, wide, beautiful place, people!) And, more importantly, it let's my son get in some games as well. So which manufacturer did I go for? Yes, you guessed it, Wargames Factory. 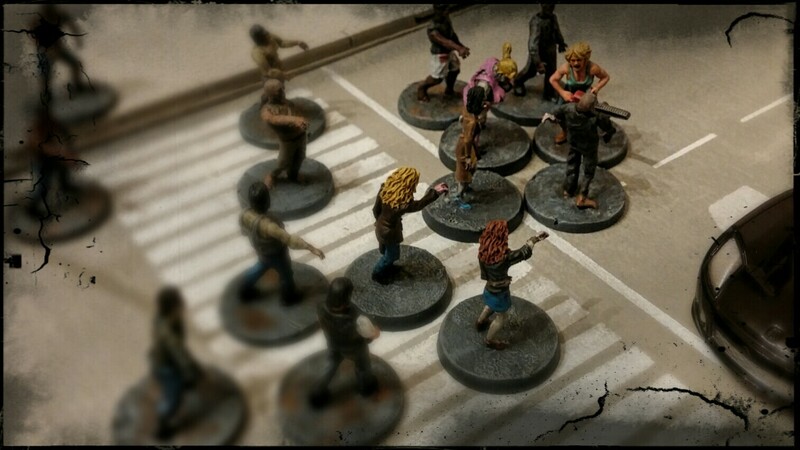 You'll see elsewhere on my blog that I recently painted up 30 Nazi Zeds for my WWZ ATZ variant. These were from Studio Miniatures and, although I they only had two bodies in the set, the variety of poses achievable was surprisingly good. Especially when we're talking about gormless Zombies. They're not famous for dynamic poses, you know. I did consider getting a pack of their modern Zeds. However, at £30 for 60, it was both too much to fork out in one go, and was really just too many Zeds for my needs. Maybe. Anyhoo, I went with the Wargames Factory. After all, these are the ones we've been using in our games so far, and they look great. I ordered mine on ebay from Nannyogg999. Here's how they came, and they were very well packaged indeed. You probably can't really see them, but the box is resting on those polystyrene figuers of eight. Uh, yeah. Hi. 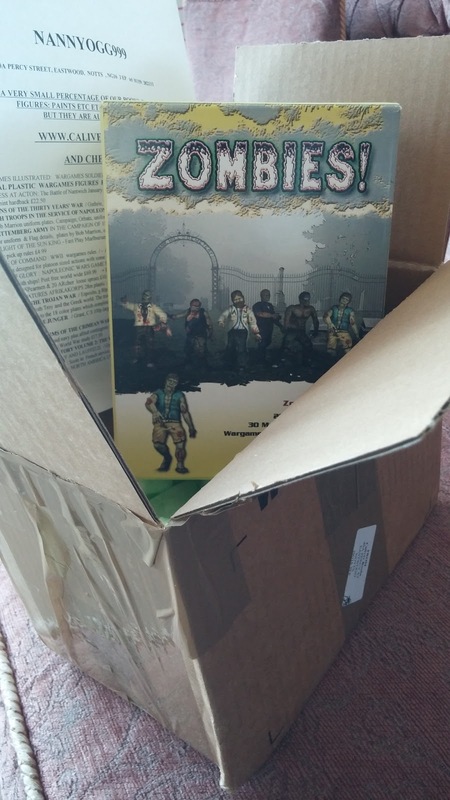 This is (insert trying to sound cool name here) bringing you an unboxing of...um...this box of..erm...plastic Zombies from...um...Wargames...Wargames Factory. It says it's a box of thirty Zombies, so yeah...let's see what we get. Well, when we open the box, we find sprues to....um... make...well, there's enough bits to make... um... thirty Zombies. Now, I'm wanting to get these Zeds made, painted and onto the gaming table as soon as possible. And since they're Zeds, they're going to be messy, because, as we all know, personal hygeine is not high on a Zed's bucket list. It's generally all Brains. Munch. Brains. Brains. Brains. As far as they are concerned. 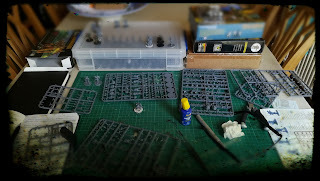 Of course, all of this means I can use washes and work in batches, which means your average 30 Zeds will come up an awful lot quicker than a comparable number of Napoleonic Infantry for example. First things first, then. Making them. Now, Wargames Factory Zeds are smaller in stature than their later models. This might put some people off. After all, they aren't as tall as WF's male and female apocalypse survivors. Personally, I don't mind all that much. Zeds aren't known for standing up straight, chests out and all that stuff. And the difference in height isn't all that noticeable when you're gaming with them. No one has ever made a comment about this on any of my posts. And after all, you can easily compensate for this with the basing. 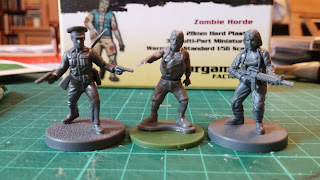 Unlike later releases from WF, the Zeds don't come with bases on the sprues. What you get instead is a plastic equivalent of the good old fashioned puddle that metal miniatures usually come attached to. Perfectly good for helping the little chaps to stand up on their own. But not enough for gaming purposes. So I'm basing my models on Renedra's plastic 25mm diameter circular bases. Almost all my models are based this way. And I've decided to simply stick my Zeds to this base without removing that plastic puddle. I reckon this way they'll be about the same height off the ground as the survivors who sit on those lovely Wargames Factory bases the more modern sets come with. And you know what, after doing this, I really can't see what the fuss is all about. Looks perfectly in scale with the survivors. Of course, this all leaves the question of finishing off the bases. It would have been easier to simply cut off the puddle. However, I'm going to use either mulliput or polyfiller to finish them. A good solid mix of the latter will give me a good concrete-like finish. But there's no point mixing that up until I've made the others. One down, twenty-nine to go!